The Obama administration, which will send Vice President Joe Biden to Arizona on Tuesday to mourn 19 firefighters killed in the Yarnell Hill fire, is cutting federal programs meant to control the spread of exactly that kind of catastrophic wildland fire. A firefighter keeps watch over a controlled burn at the Black Forest Section 16 Trailhead Thursday, June 13, near Colorado Springs, Colo.
Fire and land management officials are warning that more firefighters will be in danger, and more homes will be burned, if the nation continues to spend more on putting out forest fires while spending less on preventing them. But federal officials, while acknowledging the danger, say firefighting efforts are costing so much that they're leaving less money for prevention. For the third year in a row, the Obama administration has proposed slashing spending on hazardous fuels reduction, the federal buzzword for clearing away underbrush and smaller trees through controlled burning and cutting. The idea behind such work is to make future fires easier to put out by removing now the fuel they need to spread rapidly. Congress has cut the program in the past two years. For fiscal 2014, the administration proposes cutting by another 41 percent, or $205 million, eliminating more than 1,000 jobs. These cuts will hit the Forest Service, the National Park Service and other federal land agencies. The cuts have drawn protests from inside and outside the government. "The fire agencies strongly believe in the value of hazardous fuels reduction work," Donald Smurthwaite, spokesman for the National Interagency Fire Center, told NBC News. The agency in Boise, Idaho, is the federal nerve center for the nation's wildland fire effort. "In a recent study by the Bureau of Land Management, when wildfires burned into fuels treatment areas, they were slowed or stopped about 90 percent of the time. With the decline in fuels funding, we're worried that saving money today will mean larger and more destructive fires tomorrow." Before and after hazard fuels reduction treatment at Mount Rushmore National Memorial. The project involved using chainsaws to remove most Ponderosa pine trees five inches in diameter and smaller. The budget for such fire-control efforts has been falling, and more cuts have been proposed. In the Yarnell Hill fire that killed 19 members of the Granite Mountain Hotshots fire crew from Prescott, Ariz., dense fuel is one of the conditions that investigators will be looking at. The Arizona Republic reported that a fire-monitoring station four miles from the fire measured nearly record combustion levels for the fuel on the ground. The readings "were in the 97th percentile, meaning the chaparral grass and scrub could release more energy than at almost any time since the station was installed in 1985," the newspaper reported. "The last fire in that area was in 1967, and there had been no controlled burns since then," the Republic reported. The fire was said to be 90 percent contained at midday Monday, after burning approximately 8,400 acres. 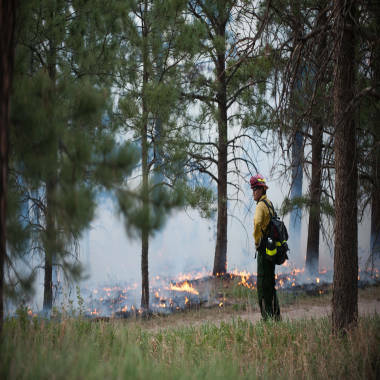 Many others in forest communities are expressing concern about the nation's fire priorities. "It is a fatal flaw to increase suppression resources at the expense of restoration and fuels reduction," said Lynn Jungwirth, of Hayfork, Calif., a leader of the Forest Guild and also Rural Voices for Conservation Coalition. She helped write the National Fire Plan in 2000, then saw the community elements of the plan wither without funding. From NBC Nightly News, June 21: Federal cuts may diminish fire prevention funding even further across the nation, forcing some communities to take matters into their own hands. NBC's Gabe Gutierrez reports. Jungwirth objects to the annual ritual of running out of money in the firefighting budget, causing money to be diverted from the prevention budgets. These huge wildland fires should be treated as national disasters, with the costs paid by the Federal Emergency Management Agency, she said. Hundreds of communities have created Community Wildfire Protection Plans for reducing fire risks, especially in the Western states, she said, but money for implementing those plans was cut during the Bush administration and hasn't been restored. "The administration and Congress appear to be walking away from supporting hazardous fuels reduction and community participation," Jungwirth said. "We will not burn our way out of this risk. We have fatalities every year where people die needlessly." An Interior Department official explained at a recent congressional hearing that the federal government values the fuels reduction program, but that cuts must be made because the cost of fighting wildland fires has risen sharply. Drought, climate change, an increasing number of homes being built near forests and other factors have made for worse fire seasons. For example, in 1991 fires consumed 13 percent of the annual budget of the Forest Service; by 2012, it was 40 percent. "The increase in complexity and intensity of fires over the last 10 years presents enormous budgetary challenges for the wildland fire program," Kim Thorsen, Interior's deputy assistant secretary for public safety, resource protection and emergency services, said at a June 4 hearing of the Senate Energy and Natural Resources Committee. "With today’s fiscal climate, and competition for limited resources, we are being asked to make tough choices. The reduction to the fuels budget is one of those tough choices." The other major agency involved, the Forest Service, did not respond to questions from NBC News. An Obama administration spokesman said the administration is proposing fully funding the firefighting budget. As for prevention, "The administration has emphasized targeting hazardous fuels treatments on high-risk areas so that we reduce risks to the health and safety of the public and protect communities," said Steve Posner, spokesman for the Office of Management and Budget. "And we are investing in further research to determine which treatments are most effective in order to better target funding in the future. While the [fiscal year 2014] budget calls for increasing overall funding for wildfires, deep cuts to discretionary funding are always going to force difficult decisions. As a result, this budget focuses resources on the most critical firefighting needs and on activities to reduce risk in places closest to where families live and work." 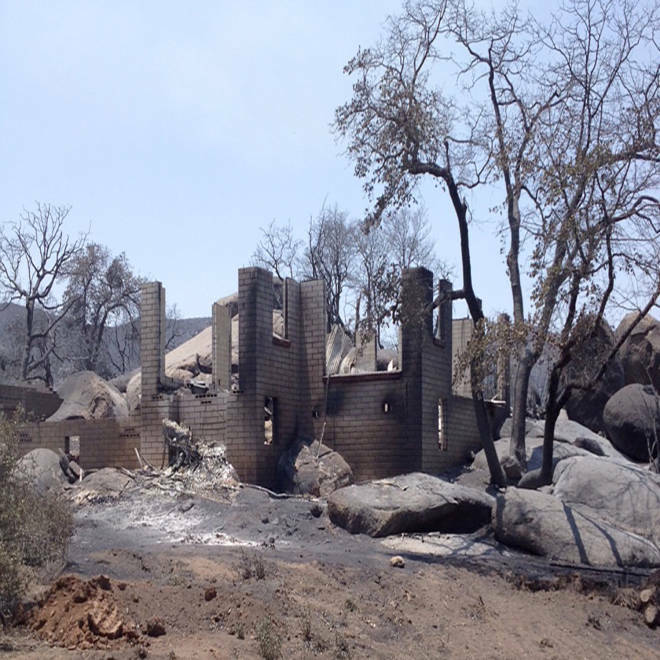 The remains of a house destroyed by the Yarnell Hill fire, which killed 19 firefighters, the nation's greatest fire loss since the terror attacks of Sept. 11, 2001. The fire issues is complex, with many interest groups and many lines of disagreement. For example, a national wildland firefighters group, Firefighters United for Safety, Ethics and Ecology (FUSEE), said it questions the assumption that more fuels reduction is the answer. Often that work is carried out deep in national forests, while the fire deaths are more likely to happen at the intersection of forests and communities. "Why were firefighters sent there in the first place? Not to protect the forest, but to protect homes," said Timothy Ingalsbee, the group’s executive director. "Why did those homes need to be protected? Because they were poorly located or poorly built. I don't think anyone should be able to build just anywhere they like and expect the public to protect them." The decline in prevention efforts is shown in the number of acres treated to reduce fuel for fires. Counting all the federal agencies, they treated 4.5 million acres in 2009; then 4.2 million in 2010; then 3.3 million in 2011; and 3.0 million in 2012, according to figures from the interagency fire center. Under the proposed budget, the area would fall well below 2 million acres next year. Obama's budget for fiscal 2014 would increase overall spending on wildland fires. But it would cut 48 percent of the Department of Interior's budget for hazardous fuels reduction, work carried out by the National Park Service, Fish and Wildlife Service, Bureau of Land Management, and Bureau of Indian Affairs. Those agencies would spend $96 million instead of the current $185 million. And at the Forest Service, part of the Department of Agriculture, Obama would cut 37 percent of the fuels-reduction budget, spending $201 million instead of the current $317 million. In all, the budgets would fall 41 percent, declining to $297 million from the current $502 million. A procession with the remains of the 19 firefighters will be held Sunday at 10 a.m. MT, with an honor guard accompanying the bodies from Phoenix an hour and a half drive to the county medical examiner's office in Prescott Valley. A memorial service is planned Tuesday at 11 a.m. MT. in Prescott Valley, with Vice President Biden speaking. So far more than $800,000 has been raised for the families of the 19. See http://yarnellfallenfirefighters.com for details. Contact reporter Bill Dedman at bill.dedman@nbcuni.com. Donna Mendell, Helen Kwong and Polly DeFrank of NBC News contributed research. On Wednesday, in a solemn tribute to Arizona's 19 fallen firefighters, fire vehicles left behind by the 19 Granite Mountain Hotshots who died in the Yarnell Hill fire slowly processed down the highway. Meanwhile, investigators are listening to radio calls made by the firefighters and focusing on the violent 45 mph winds that whipped through the area on Sunday. NBC's Miguel Almaguer reports.